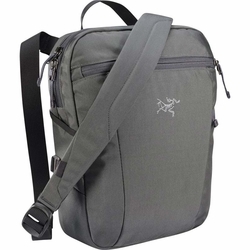 ARC'TERYX Slingblade 4 Shoulder Bag. Created to carry smaller essentials while travelling across the urban landscape, the Slingblade 4's purpose is clear and simple, but the design is surprisingly intricate. The materials, aesthetic and craftsmanship are pure Arc'teryx, the organization is thoughtful and comprehensive, and the adjustable strap provides a variety of carry options. Its clean, low profile is easy to maneuver on bike commutes, crowded trains and as an airline carry-on. Arc'teryx designs for use, and daily life requires smart organization. A sleeve in the Slingblade's main compartment secures a 10-inch tablet, and an internal zippered mesh pocket separates smaller items. An external zippered pocket has dedicated slots for phone, passport or travel documents, pens, memory cards or other small essentials, and an external stash pocket is designed for quick access. A clever panel on the back holds a smartphone, small map or transit pass, and loops on each side of the pack provide the ability to clip on a water bottle or small stuff sack.